Sea lions, nighttime main stage entertainment, livestock, a hypnotist, carnival games, auto racing, and more family fun can be found starting Tuesday September 11th at the Santa Cruz County Fair. This year’s theme “Come See the Berry Best” ensures that the best of the county will be on display. Kid’s Day is Wednesday September 12th where kids under 11 get in free. Fun hands-on exhibits and performances by Circus Imagination and Balloonacy will amuse fairgoers of all ages. Country stars “The Lost Trailers” will take the Amphitheater Stage at 7:30 PM. Thursday will feature Antsy McClain and the Trailer Park Troubadours on the same main Amphitheater Stage. Long-time Fair favorites can be seen daily. Attractions such as the Sea Lion Encounters, the All Alaskan Racing Pigs, and the livestock barn will enchant any animal lover. Fables of the West and Michael Mezmer the Hypnotist will be sure to dazzle crowds. The Fair Food booths on Apple Blossom Lane will be back with Clover Deli Milkshakes, County Fair Cinnamon Rolls and, new this year with his pig-shaped truck, Mr. Pig’s BBQ. The Carnival Midway returns, along with Yesterday’s Farm, The Talking Robot, Giant Pumpkins, and Mariachi de California. Some new additions to the Fair are Walk on Water Bubble Fun where people can play in a pool inside giant bubbles. Miniature Golf will be featured at the Fair as well as Gold Panning and the grand opening of the Heritage Hall Bar. Come to the Fair on Friday for Date Night at the Fair. The excitement of Auto Racing also starts Friday afternoon in the Grandstands. This event begins at 4:00 pm and is free with Fair admission. The White Album Ensemble will also be performing at 7:30 pm on the main stage and is also free as is all entertainment at the fair. Saturday September 15th continues the fun with more Auto Racing in the afternoon, entertainment by Katie Elkin and J.T. Hodges, and KWAV’s “Central Coasts Got Talent” competition. The Junior Livestock Auction will also take place Saturday morning. The close of the Santa Cruz County Fair will come on Sunday, September 16th after the Charro Horseshow and Banda Oro Verde at 5:30 PM in the Main Horseshow Arena and Pro Wrestling Revolution/Lucha Libre at 7:30 on the main stage. The County Fair will run from September 11th to 16th at the Santa Cruz County Fairgrounds in Watsonville. The Fair runs from Noon to 10 p.m. on Tuesday, Noon to 11:00 pm Wednesday through Friday, and opens at 10:00 am Saturday and Sunday. Admission at the gate is $10 for adults, $5 for children, and $6 for seniors. Parking is $5 at the Fairgrounds. 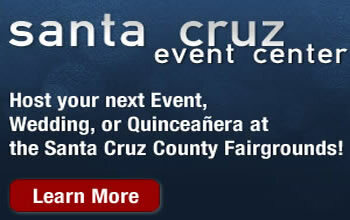 More information and schedules can be found at http://www.santacruzcountyfair.com.